Nearly 84% of Québec elementary school students living below the poverty line and in the worst poverty live in Montreal. Socioeconomic data are key resources that guide the work of Montreal Hooked on School in targeted areas. Given the importance of poverty level as a risk factor that is likely to hinder school perseverance, this section paints a portrait of the situation, thanks to expertise from MHS’s Montreal partners. Of all Montreal issues, poverty is considered the most worrisome because of its scope and its effect on the school perseverance of youth. Of the 478 low-income neighbourhoods in Canada, 35.8% are in Montreal (compared to 15.7% in Toronto and 7.1% in Vancouver). The 2006 Canadian Census showed that 24% of families in Montreal with children under the age of 18 live below the after-tax low-income cut-off, compared with 8% of families in the rest of Québec. 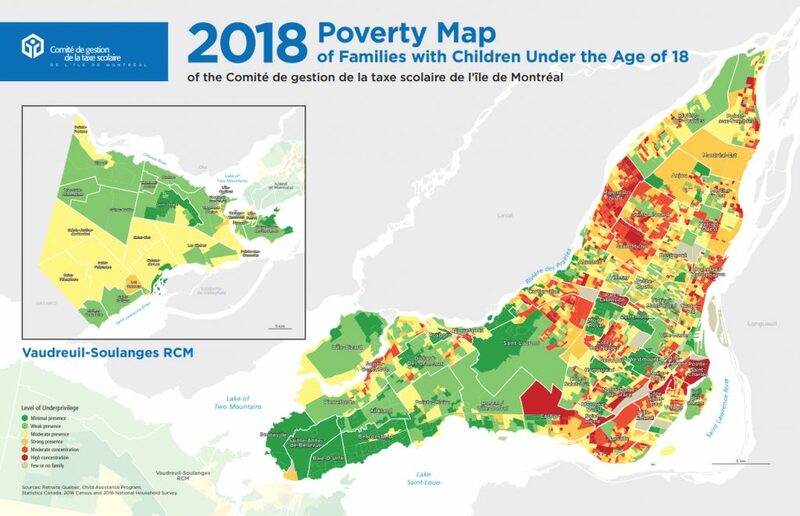 In total, according to calculations by the ministère de l’Éducation et de l’Enseignement supérieur in 2008, nearly 84% of Québec elementary school students living below the poverty line and in the worst poverty live in Montreal. In 2014, Montreal’s percentage of such families was 43% higher than that of the province, while in 2017, it was 41% higher. Each of these zones includes, on average, 459 families with children under the age of 18. Neighbourhoods located in areas with moderate to high concentrations of underprivilege include La Petite-Bourgogne, Parc-Extension, Montréal-Nord, Saint-Michel, Pointe-Saint-Charles, Ville Saint-Pierre, Sainte-Geneviève and Côte-des-Neiges. In terms of schools, this geographical concentration of poverty means that certain schools have a significant concentration of underprivileged students. It is also important to note that between 2011 and 2016, the level of deprivation has worsened in Pointe-aux-Trembles, Pierrefonds, Dollard-Des Ormeaux, Ville-Marie, Côte-des-neiges and Sainte-Geneviève. However, the situation has improved in Verdun, La Petite-Patrie, Villeray and Le Plateau-Mont-Royal. Youth living in underprivileged areas are more likely to have trouble at school. Many studies have shown that young dropouts are up to twice as numerous in poor neighbourhoods. The 2012 Québec Survey of Child Development in Kindergarten showed that children living in underprivileged neighbourhoods are more likely to be vulnerable in at least one developmental domain. This means that they enter school with less preparation. It is important to stress that such children are not predisposed to failure; rather, they are less equipped to learn in certain disciplines and to benefit from what the school has to offer. The program Une école montréalaise pour tous points out that vulnerability is assessed based on expectations of the educational environment; in other words, the life experience of so-called vulnerable children differs from those expected by the school. Other studies indicate that youth from underprivileged neighbourhoods believe they are less capable of succeeding or think they have no control over the conditions that lead to success. Students from underprivileged areas are at greater risk of developing language development delays, hyperactivity, learning disabilities, academic delays, and behavioural troubles, which significantly increase the risk of dropout. In communities with high levels of poverty, social and material disadvantage can become a vicious cycle that keeps people powerless and prevents them from fully participating as citizens in society. Through their actions, community stakeholders can help mitigate the effects of poverty in order to break the cycle of inequality. It is important to point out that two of the indicators used to calculate poverty levels are also major determinants of educational success among children: education level of mothers, and single-parent families led by women. 9.2% of mothers of Montreal families with children under 18 years lack any diploma or qualification, which is comparable to the Québec average (8.7 %). 33.1% of mothers of Montreal families with children under 18 years lack a high school diploma, which is lower than the Québec average (29.0 %). This indicator represents the percentage of single-parent families with children under 18 years who are led by women. In Montreal, the percentage of single-parent families led by women has gradually declined, dropping from 22.2% in 2011 to 21.2% in 2016. Montreal’s rate is nevertheless higher than the Québec average (18.7%). In light of the research and statistics, it should be pointed out that the characteristics of poverty are not inherent, and that poor children are not destined to failure. Children from poor neighbourhoods have specific needs, and this means that schools and communities must adapt their responses to meet these needs. Education helps to mitigate the effects of poverty and reduce social and academic inequalities. It is thus important to mobilize the entire community around schools in order to break the cycle of inequality. The fact sheets produced by Réunir Réussir on neighbourhood of residence and community resources also offer courses of action to reduce the effects of poverty.